【Smooth and Safe Edges】Fits most of brand's paper rollsThe storage shelf comes with smooth and flat edge, so it will never hurt you when you place the phone or other things on it, it is also safe for your children. 【Humanized Design】Easy to clean by soft towel and fits most of brand's paper rolls(regular rolls, double rolls, large rolls). The top plate can prevents the toilet paper from getting wet if mounted near the sink, update gears makes you easy to switch out the toilet paper. 【Easy to Install】It's come with the screws, easy to install. Fits home, hotel, restaurant, toilet and so on. 6.5"*4.7"*4" dimensions, suitable for most roll paper. 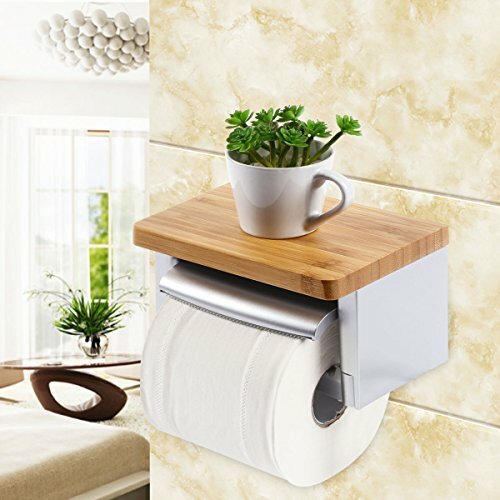 This toilet paper holder with shelf is a good choice if your bathroom is not large enough.